In Black Heart and White Heart—a compelling example of Haggard's characteristic (if not unproblematic) elevation of some Africans above some Europeans—Haggard compares the noble Zulu warrior Nahoon with the wicked white European Philip Hadden. BHWH was frequently published with additional novellas by Haggard, including Elissa; or, The Doom of Zimbabwe and The Wizard. 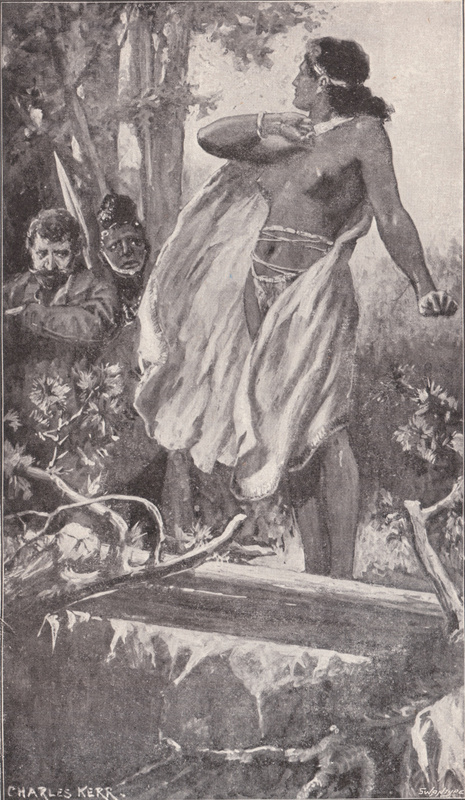 In January 1896 The African Review serialized BHWH with illustrations by Charles Kerr for the New Year edition. Longmans, Green, and Co., London, published Black Heart and White Heart and Other Stories on 20 May 1900. This edition includes a total of 34 illustrations by Kerr and Townsend. Kerr illustrated BHWH (7 illustrations, although the frontispiece is repeated on page 34) and TW (19 illustrations), while Townsend created the 8 illustrations to accompany Elissa. 10,000 copies printed. The Longmans, Green, and Co., New York, edition published in 1900 omitted TW and was retitled Elissa, the Doom of Zimbabwe; Black Heart & White Heart, a Zulu Idyll. This edition includes 8 of Townsend’s illustrations for Elissa, and 5 of Kerr’s illustrations for BHWH. in 1900 Tauchnitz of Leipzig published a copyright edition pairing BHWH with Elissa. "Black Heart and White Heart" from Elissa The Doom of Zimbabwe; Black Heart and White Heart. London: Longmans, Green and Co., 1900. "Black Heart and White Heart" from Black Heart and White Heart and Other Stories. London: Longmans, Green, and Co., 1900.